Superb Condition, FORD CERTIFIED PRE-OWNED. If you are looking to add a full-size sedan to your garage that has tons of cargo space, has top safety ratings, has peaceful and comfortable ride, and has plenty of features than this beautiful Taurus deserves a test drive. The exterior of this Car features very slick design. Overall height of this Car will give you commanding view of the road. When it comes to interior, Ford has done wonderful job with Fit and finish. The cabin of the Car is attractive and has upscale look and feel. Call us today to schedule a test drive and we are certain that you wouldn't want your test drive to end. 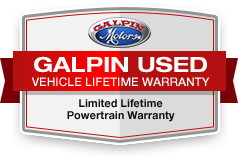 Also please inquire about 'Galpin Used Car Difference' during your visit. All figures are EPA estimates. Actual mileage will vary. Kelly Blue Book values are calculated based on the current Retail Book. Pricing analysis performed on 3/13/2019. Please confirm the accuracy of the included equipment by calling us prior to purchase.